It’s the end, and also the beginning. “Arms Of Mine,” 12 Monkeys’ season finale, starts with the same monologue that opens the series. “Where are you now? Someplace warm? Safe? Next to someone you love? Now what if that was gone and the only thing you could do was survive? You would, right? You’d try. You’d do things, horrible things, until you lose that last thing you have left: yourself. But what if you could take it back, all of it? A reset switch. You’d hit it, right? You’d have to.” It’s richer now, because 12 Monkeys has given us characters to care about and a deftly woven series of complications to unravel and reweave. Like the butterfly flapping its wings (or the tourist stepping on the butterfly), that small difference changes everything. The gulf between “You’d have to” to “You’d have to… even if you didn’t want to” is the difference between choice and fate, between tortured necessity and predestination, between guilt and blamelessness. “Paradox” ties together the sometimes straggling stories of the first season, and “Arms Of Mine” continues, using those divergences—Ramse and Cole’s history with The West Seven, the history of Spearhead, Ramse’s unfailing forbearance—to give weight and color to its plot. Deacon’s posturing viciousness made him a caricature of a warlord, but now that he’s reduced to working as a mercenary for The 12, his bombast looks like the hollow bluster it always was. Grinning at his clientele’s archaic language, asking the dangerous question, “Where are you from, exactly?” with heedless delight, he’s an unwitting jester. Aaron Marker went from plucky comic relief to shrewd Washington insider to pathetic traitor with alarming speed, and his excruciating death is the price he pays for that last transformation. The fiery end Aaron brings on himself is the aftermath of his attack on Cole with a makeshift flamethrower. It’s a convenient way to remove Aaron from the story and deliver a comeuppance for his betrayal—of Cole’s mission, of Cassie’s wishes, of the whole human race—but it also spares Cassie and Cole any culpability, stripping away the opportunity to contrast the Cole of the season finale with the Cole of the pilot, whose numb willingness to kill shocks Cassie. That’s especially striking because there’s a thread of vengeance running through “Arms Of Mine,” galvanizing characters to action or excusing their callousness—even Cole’s. Tied to a chair, beaten to extract what little information he has, Aaron taunts him, “You’re no savior. You’re just a savage.” Cole points out that Aaron’s betrayal made him the brute he had to be. “I was just a boy, watching the world die, alone. Now I know who I have to thank for that.” Coldly, deliberately, he hits Aaron again. When Cassie struggles to help Aaron, Cole tells her, “He made his choice.” She accepts and even seconds that rationale, later brushing away Cole’s consolations. “He betrayed us. He betrayed me.” But when Cole pleads for Ramse’s life, she spits his words back at him. “He made his choice,” she says, and fires, though she must know Ramse’s bodyguard will fire on her, too. These aren’t people striving to survive; they’re seeking reprisal. Revenge creates its own kind of inevitability, its own kind of fate. It’s where fate and choice intersect, where individuals decide to let their history define their future. Even Ramse’s usual stability is undermined by resentment and hunger for retribution. In the pristine splinter chamber of 2015, his calm cracks and bitterness surfaces. “Jones didn’t even want me there in 2043, and it was mine.” Ramse’s investment fostered Project Splinter, but in his own time, he was stuck playing second banana, accepted reluctantly as Cole’s companion, watching while his little brother leapt through time. “It took time travel to create time travel,” Ramse tells Cole. “That’s how it works, brother. There are no straight lines.” That’s one of the philosophies posed by 12 Monkeys’ first season: Fate isn’t a single strand, it’s a web, and it winds around us all. Urging Cole to pull the trigger (and when Cassie actually does), Ramse doesn’t blame them. Whether he escapes to 2043 to join his son or dies in 2015, he believes his fated circle is completing, and he accepts it. 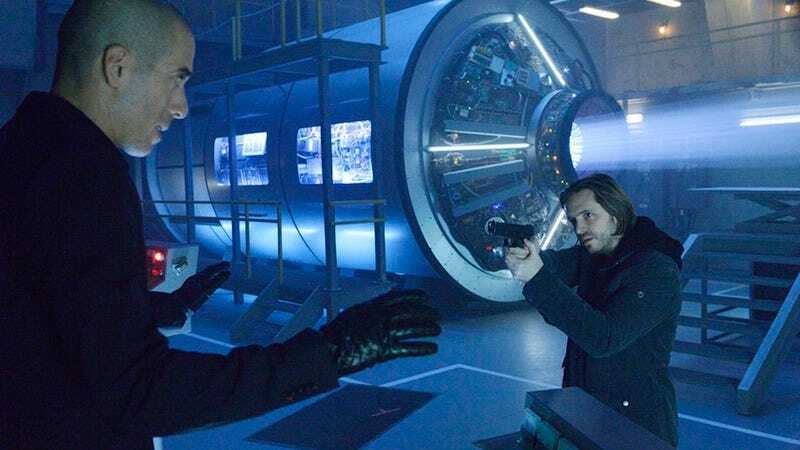 12 Monkeys is woven from the interplay of fate and choice, and in the season finale, it declares one thing more powerful than fate, more potent than vengeance: love. It’s love that drove Jones to rewrite history in hopes of resurrecting her daughter. It’s love that sent Ramse back to stymie Cole’s mission. It’s love that spurs Cole to send Cassie into the future, where perhaps Jones can save her life. Over and over, Olivia and her fellow believers describe time as a circle. Fate may shape the circle, and vengeance perpetuates it, but love can break the cycle. That’s the end of 12 Monkeys’ first season! Thanks for joining me, and we’ll meet back here for season two. Those of you with access to time travel won’t have long to wait, and the rest of us thank you for refraining from spoilers. Aaron’s tux never did reappear, did it? Dr. Jones, the gladhanding sneakers-wearing scientist heading Raritan, must be Eliot, Katarina’s husband of six days. The first season ends, as the film does, with a woman on an airplane, drinking champagne. Without spoiling the film, I can say: Jennifer’s 12-city itinerary is ominous. Chekhov’s monkey: Ramse insists he is not The Witness. I look forward to your speculations in the comments, and to get things rolling, here’s a tally of what we know: Cassie sees The Witness in her vision, but “a kind of plague doctor mask” obscures his face. Jennifer describes The Witness as the “only one who truly knows, who sees, did see, will see.” In the same episode, in a sequence not bookmarked with a year—which usually means 12 Monkeys is up to monkey business—Cassie finds Cole wounded in her storefront, gasping “They’ve been one step ahead of us the whole way. Now I know why. I know who the witness is.” The Pallid Man says The Witness would testify to the Earth’s many mass extinctions; 12 Monkeys highlights Cole’s role as witness to mass extinction. Cole is now tethered to Cassie’s present, but in 1987, Markridge was “10 years from human cloning,” so it’s anyone’s guess how many Coles—how many of anyone!—could be let loose on the past, present, and future.